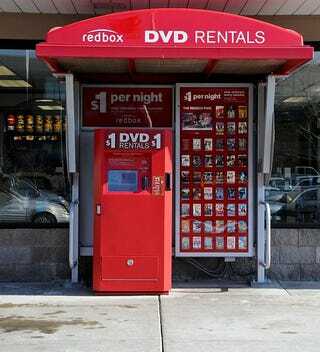 Your mom's probably rented a DVD from Redbox—those hulking vending machines lurking outside of grocery stories, lending out DVDs for a buck a day. Walmart's not thrilled with them, and now blocking new release purchases in bulk. Part of the reason Redbox is able to offer rentals for cheap of the latest movies is that it works outside of the studio system when studios who won't sell it discs to distribute for same-day release. According to Adams Media Research, it buys about 40 percent of its movies from big box retailers. So, Walmart and Target have reacted by cutting the number of new releases you can buy at a time to just five copies. They care because kiosk rentals could be worth over a billion dollars this year—why should they subsidize their profits?